As the world celebrates Global Entrepreneurship Week from 17-23 November 2014, the National Youth Development Agency (NYDA) calls for more young people to consider entrepreneurship as a viable career opportunity. The NYDA offers a number of support opportunities to young entrepreneurs like the NYDA Business Grant Programme, providing grant funding to youth-owned businesses of up to R100 000. Additional to this, the NYDA implements a voucher programme allowing young entrepreneurs access to a range of business development support services. Through a partnership between the NYDA, the Industrial Development Corporation (IDC) and the Small Enterprise Finance Agency (Sefa), a R2.7 Billion loan facility has been established for the development of youth entrepreneurship in South Africa. The Global Entrepreneurship Monitor (GEM) Report for 2013 indicated that only 13% of young South Africans had intentions of starting a business. This represented a decline from 15% in 2012 and a shocking statistic when compared to the region’s average of approximately 56%. 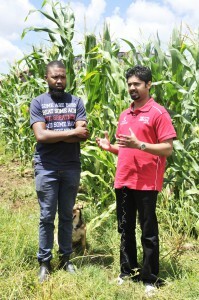 IMAGE: Bahlakoana Moleko, twenty six year old farmer in De Deur South of Johannesburg who is one of the NYDA Entrepreneurship Grant Programme beneficiaries, with NYDA Executive Chairperson Yershen Pillay.